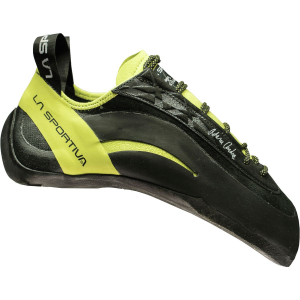 Great shoe that is sure to help improve your climbing experience. 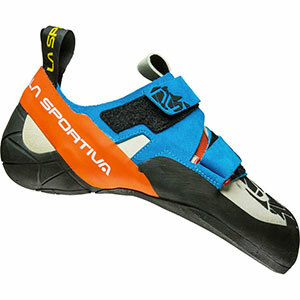 I would never think of wearing any other climbing shoe for technical routes. Even though it's a matter of personal preference I'd suggest wearing them smaller than your regular climbing shoe to get the most out of the toeing and edging capabilities. They are somewhat narrow so people with wide feet might have problems finding a comfortable side, but they do stretch after a few days of use so take that into consideration when selecting a size. Also, the snug fit helps improve toeing and edging accuracy. The rubber on the soles has great grip even out of the box. Also, they smear great once you get used to the more curved shape. The narrow heel on the shoe allow for heel hooking even on tiny holds. The most notable, yet easily ignored feature are the Velcro straps. Not only do they help to quickly put them on and take them off, they help maintain a snug fit even during a long route without having to worry about them loosening along the way. Finally, the leather/textile combination make them comfortable enough for long continuous use while still remaining durable and able to withstand continuous use in less than ideal conditions. If I had to pick only one shoe for hard climbing, this would be it. 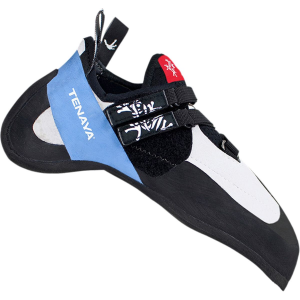 This shoe does it all for face climbing/bouldering. Of course, shoes fit feet differently, depending on foot type. I have a wider, high-volume foot, and this shoes is excellent. The toe box is perfect for getting my weight on my big toe. Size this one down, and let it break in for a month. I've heard of too many people claiming they got them too tight. If you give them time, they will break in like a glove. I wear 11.5 street, and I wear these in 41. I've also worn them in 40.5 with a much longer break-in time. Hi all. I have been using Miura VS (size 38.5) for about 4 months (near 3 trainings per week). Overall they are great, but I become confused with the next thing: my shoes are 1/2 inch smaller than the same Miuras (37.5) of one guy. I tried his shoes and i should say, that they are more comfortable with the same performance. We have bought them in the same shop, and have been using them for nearly the same period of time. So i have a question - is there a chance, that my shoes will get stretched 1/2 inch in the future? Thanks. Use: performance oriented climbing. Gym, bouldering, sport climbing. I bought these shoes extra small 42.5 when I usually wear a 44. Edging and smearing is superb and give exceptional control on small holds. Works extremely well on small edges both in and outdoor. Heel hooks are very natural and when adjusted tight feel solid with no slippage. On overhangs it works particularly well. Can be worn for about 1/2 hour before it will require loosening up to give feet a rest. The shoes will stretch minimally after a few weeks, about 0.5 sizes at most. 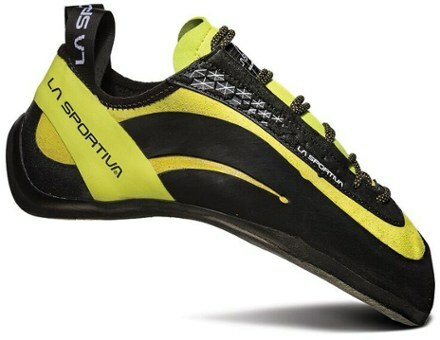 They will stain your feet as most La Sportiva's with bright colors will do but that does not affect performance. Overall an excellent high performance aggressive shoe with reasonable comfort when sized for high performance. In short, these are the best shoes I have ever owned. In short, these are the best shoes I have ever owned. The edging is incredible and like all Sportiva shoes I love the rubber. Basically, put your foot on the rock and as long as you trust your feet like you should, they'll stick. I have some what of a large, but skinny foot. I normally wear a size 12- 12 1/2. I got these in a 44 and they have a little bit of excess material over the knuckles of my toes but strap them down tight and it does not seem to matter much. They stretch about a 1/2 size max in my experience, so make sure to compensate if you need too. 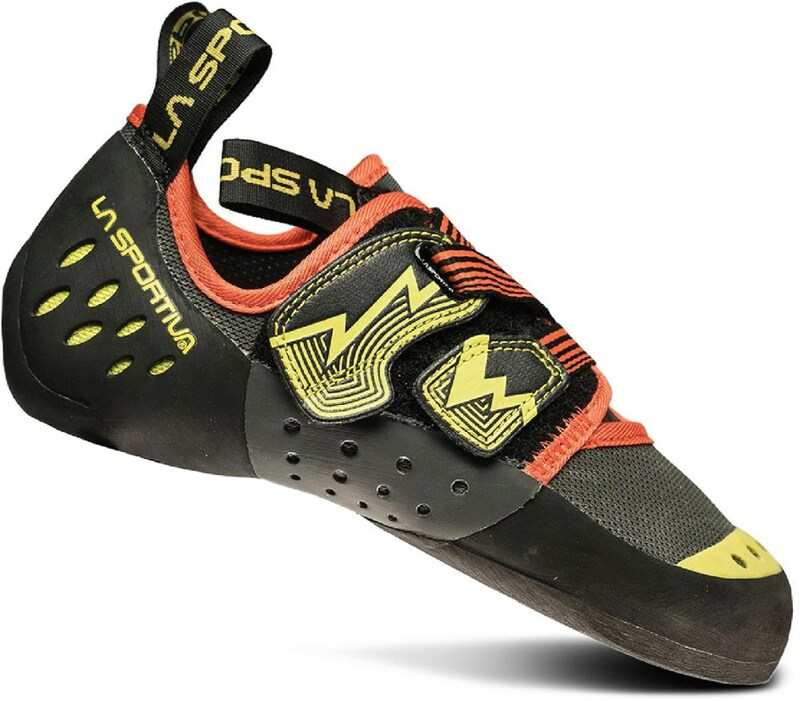 Great shoes for sport climbing but if your into long trad climbs, might want to go with something a little less aggressive because after awhile, your foot gets a little sore. 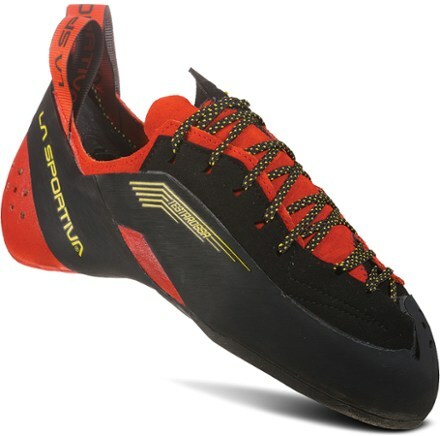 La Sportiva has done it again. This shoe is ultra aggressive, with a firm but comfortable fit. they make a huge difference when i climb tough routes, i can stand on tiny jibs and i don't have to worry about slipping off. It has a really solid heel that i can depend on 100%. I can climb harder than ever before with these on. They are great for gyms and outdoor. If your feet are still growing, i would recommend getting a 1/2 a size larger than your normal climbing shoe size, because these are pretty tight. they loosen up after a month of moderate use in a gym (once-twice a week). but they're still tight. They keep their arches for a long time, and you don't have to worry about replacing the rubber. if i am climbing something really long (or climbing different routes for more than 2 hours), i have to take them off to let my feet stretch out. Overall, these are great shoes for someone who is ready to step up their level of performance. Dependable, solid, and aggressive. I'm very critical of shoes, but these are the best out. The edging is sweet and the heal is perfect. On every one of my hardest bouldering sends last fall, I was working on them in my Anazasis, then tried later after I got the Miuras, and got the send.